USD alumnus Stephen Wallace was in Bangladesh recently. He was working as a photographer with a filmmaker from London who was making a documentary on the plight of Rohingya women in the refugee camps near Cox’s Bazar in southeast Bangladesh. On days he was not working with her, he hired a translator and went out amongst the Rohingya to record their images and hear their stories. “There was little I could offer to comfort them,” he recalls. “They asked me to tell the people of the United States that a genocide was occurring in Myanmar. I promised to do so. The world needs to help these people. Only international pressure can put a stop to the killing.” Please note that some details in this article are graphic and may be distressing. Her scarred face was dimly lit in the small hut that was provided by the United Nations. She was anxious to tell her story. It came out of her in an impassioned torrent that could not be slowed. I sat there, stunned, wishing I could tell her something to ease her anguish; something to make her forget. I was in a Rohingya refugee camp near Cox’s Bazar, Bangladesh. 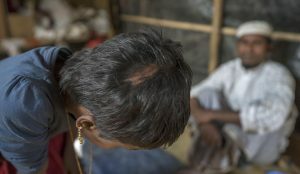 The woman with the scarred face was Rohingya. The Rohingya is an ethnic group in Myanmar that has been the subject of many recent worldwide reports. Both The New York Times and the BBC had been writing extensively about the Rohingya fleeing for their lives into Bangladesh as the Myanmar army burned down their villages in southwest Myanmar. Doctors Without Borders estimated 6,700 had been killed since August 2017. Horror stories were being recounted daily, straight out of the mouths of the Rohingya as they flowed into Bangladesh by the hundreds of thousands. The scarred woman’s name is Momatz. She lived in Myanmar until the Myanmar military started to burn the homes in other nearby Rohingya villages. She and her husband had heard the military was heading toward her village. They were packing to flee when a Buddhist government official arrived in her village to reassure her and her neighbors that they had nothing to worry about. The official said he would protect their village. The official told them to stay. He told them they would be safe. She believed him. She stayed. The next day the Myanmar military arrived at her village. The Buddhist government official was gone. Momatz and her family had been tricked. I heard this story while I was working in Bangladesh as a photographer. I hired an English-speaking guide with extensive knowledge of the Rohingya refugee camps. After a day and a half of taking pictures I told my guide I wanted to hear their stories. I wanted to know if the newspaper reports were true. Before visiting Momatz, I was invited into the hut of a family from a different Rohingya village in Myanmar. I took off my shoes and entered the small shelter. A 15-year-old girl limped in and with difficulty lowered her body to sit on the floor with me. Her mother and father sat on each side of her. The teenager’s name was Umme. Umme and her father told me their family was running from their village, which the Myanmar military was in the process of setting on fire. The family was attempting to exit by the main egress from their village, a dirt road surrounded by dense vegetation. Once they were outside the village the soldiers suddenly appeared from behind trees and bushes and started firing rifles. The family was caught in an ambush, an ambush meant to kill unarmed men, women and children. The family kept running. Umme was hit in the leg. She went down. Her father and an uncle carried her into the jungle and hid her. Umme’s mother was hit in both legs. Umme and her mother didn’t receive medical care for days. Umme sat emotionless as she told her story. Her father wiped tears from his eyes and struggled to maintain his composure. I am a physician. (I had not told the family of that fact.) As I listened to the story, I kept wondering how extensive Umme’s injury was. 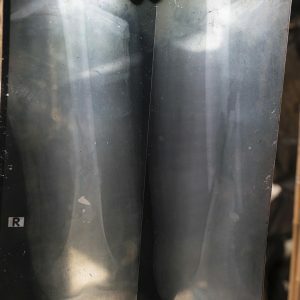 To my surprise, the father reached around a corner and pulled out an X-ray of Umme’s leg and handed it to me. I took the X-ray to the doorway and held it to the light. I was surprised by what I saw. The femur, the thighbone — the largest, strongest bone in the body — had been shattered, blown to pieces. A large fragment of the bullet was easily visible and still embedded in her leg. How incredibly painful the injury must have been, and she had no pain medication for days while the leg was jostled as she was carried for miles. My throat tightened and I blinked to fight away tears. I stood silently, holding the X-ray to the light, trying to absorb the inhumanity that produced this injury. I moved away from the door and sat back down. The father handed me a few pages of medical records. I studied them. The medical records verified the family’s story. Fortunately, the mother’s two leg wounds were superficial. They also told me the uncle that helped carry Umme to safety was later shot and killed. The father asked me to tell their story in the United States. My guide and I left Umme’s hut. I was shaken. He was not. He had been hearing these stories for months. He took me to another tent. It was the tent of Momatz, the woman with the facial burns. She had escaped Myanmar in August 2017, as had Umme. Tears and nearly uncontrolled emotion immediately appeared. She talked rapidly. My guide attempted to slow her down in order to translate her story into English. She spoke with urgency. Momatz’s daughter shows her injury. Momatz told me the Myanmar army rapidly entered her village. All the Rohingya males were rounded up and taken to the center of the village. While their families watched, the men, including Momatz’s husband, were shot in the chest. Before her husband died, he looked at Momatz who was standing just a few yards away, and asked her for water. A soldier heard his request, returned to him, and slit his throat. Momatz attempted to come to the aid of her husband while holding her baby. She was stopped by another soldier who then grabbed her baby from her arms and threw the baby in an inferno of burning debris. Momatz heard the cries of her infant. Then, she and the other woman of the village were forced into the only house that was not on fire at the time. She and the other women were repeatedly raped, and then locked in the house as it was set on fire. Momatz was able to escape the fire, but 30 to 40 percent of her body bears the scars of the fire. While Momatz told her story, an eight-year-old girl sat in the corner crying. It was her the only surviving child. The girl had somehow escaped, but she had scars on top of her head from machete blows administered by the soldiers. I felt as if a huge ocean wave had hit me and put me on my back and I could not get up. I was stunned. I could think of nothing to say. I did not cry. My mind did not want to process what I had just heard. It was later that night, back at the hotel, when I broke down. During my travels, I have heard some terrible things. Once, I spent a daylong car ride with a member of the Cambodian Khmer Rouge army who admitted at the end of the day that he had killed innocent people during the 1970s. I have talked with the survivors of the My Lai massacre, in which the United States military, during the Vietnam War, went on a rampage killing unarmed women, children, and old men. 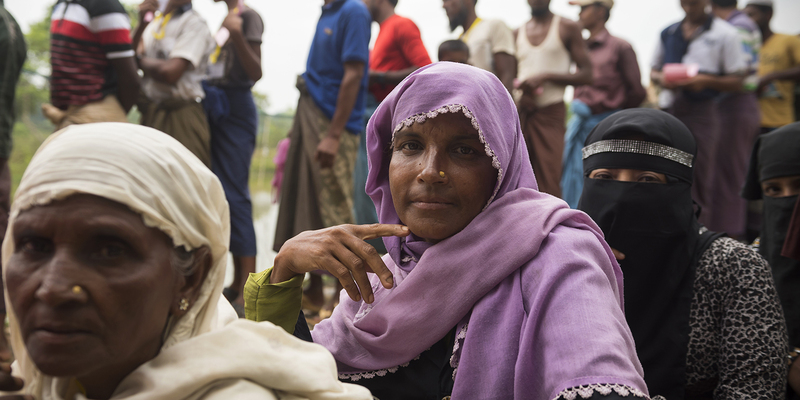 Yet nothing has caused me more sadness than seeing and talking with the Rohingya. The grief of these people is overwhelming. If you want to help the children of the Rohingya please give to Unicef.